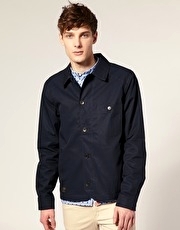 Produktbeskrivning för Paul Smith Jeans Shirt Jacket: Shirt jacket by Paul Smith Jeans . Featuring single breasted button through closure, breast pocket with button closure, button fastening tabs to the reverse, logo tab to the front, diagonal cut to the front of the jacket. ABOUT PAUL SMITH JEANS After an accident ended his promising cycling career, Paul Smith was propelled in to the world of fashion. Famed for his mantra classics with a twist Paul Smith has been at the forefront of the menswear scene for over thirty years, captivating audiences with his creative style and quirky detailing.